Cut lemons in half. Cut 1 lemon half into thin slices. Squeeze enough juice from remaining lemon halves to measure 1/3 cup. Add boiling water to gelatin powder in medium bowl; stir 2 min. until completely dissolved. Stir in drink mix until dissolved. Mash pineapple. Add to gelatin mixture with lemon slices, lemon juice and mint; mix well. Pour into 9-inch square pan. Freeze 3 hours or until firm. Remove dessert from freezer; let stand 5 min. Process in food processor or blender until smooth. Transfer to freezer container; freeze 4 hours or until firm. For best results, do not use canned pineapple chunks to prepare this refreshing dessert since that would cause the gelatin to set resulting in a gelatinous texture instead of the smooth creamy granita you get when you use fresh pineapple. 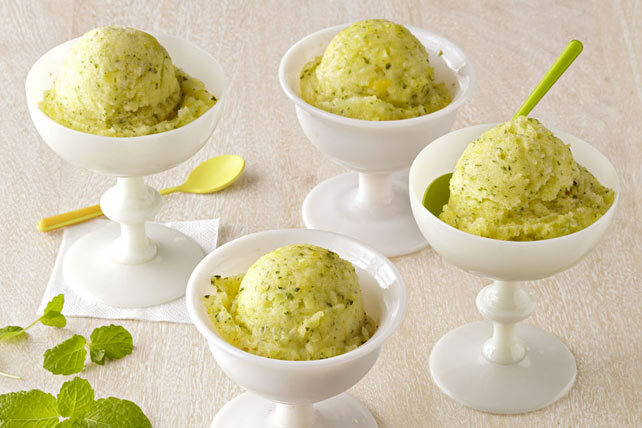 Finished sorbet can be frozen up to 24 hours before serving.